The following is a transcript of an interview conducted by the author at the National Museum of Syria with an employee of the Directorate General of Antiquities and Museums (DGAM). 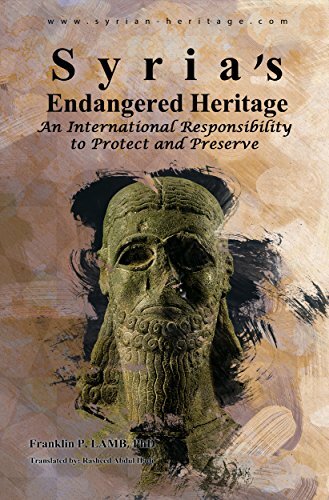 The gentleman had been working in the governorate of Raqqa, in eastern Syria, when armed groups arrived and began looting museums and conducting illegal excavations of Global Cultural Heritage sites. Since 2013, the area has principally been under the control of one armed group in particular, ISIL. The name is an acronym for "the Islamic state in Iraq and the Levant," and is sometimes also referred to as "ISIL." The two names are interchangeable. All shop owners in Raqqa must close their stores immediately upon the announcement of prayer and go to the mosque, a decree posted by ISIL on 4/27/14 read, "Any violators after the issuance of this announcement will face consequences." New laws by ISIS have been posted around Raqqa with leaflets directed to Raqqa's Christian community. Christians forced to pay a special tax to ISIL and are strictly forbidden to wear or exhibited crosses in any way. Christians are forbidden to repair or maintain war-damaged churches. Christians are not allowed to recite any prayer in the presence of Muslims, and are subject to conservative dress codes as imposed by ISIL. On May 1, 2014, ISIL militiamen dragged a man across a public square and tied him to a pole his arms tied outstretched along a wooden plank as blood flowed from a head wound. A sign in Arabic was taped to his shirt. "It read, "This man fought Muslims and detonated an IED here." One member of a recently formed anti-ISIS activist group in Eastern Syria, called, "Raqqa is Being Slaughtered Silently" which claims 12,000 follows on its Facebook site, reported recently that on May I, 2014, ISIL executed seven prisoners with five victims being an 11 year old boy. Another witness took photographs to document the story of bodies strung up to look like a crucifixion. This practice is being used more frequently these days in order to send a message that as a ISIL spokesman announced, the public crucifixions are warnings to anyone who challenges Islamic rule because they are the enemies of Allah. According to Abbas Barzegar, assistant professor of Islamic studies at Georgia State University, USA, "These violent acts are part of a fundamentalist revival campaign, but these forms of ancient punishment were rarely if ever seen in the Muslim world in recent centuries. Yet they have now become a common practice of fringe Islamist groups to revive these outdated practices in an effort to bring back what they believe is authentic." The United Nations, the Syrian opposition and human rights groups have corroborated the scenes of horror in Raqqa. Earlier this year, U.N. High Commissioner for Human Rights stated the obvious which is that these mass executions and mistreatment, including repeated beatings, of prisoners at schools and hospitals are war crimes. Franklin Lamb: What was your job and where were you working before the armed groups took control of the Al Raqqa Museum? When was it, and what events alerted you to the take over? Who was the armed group and where did they come from? DGAM Employee: Just before the armed group took control of Al Raqqa city, I had relocated to Damascus to work on another related documentation project at the Directorate (DGAM). My job as director of our project was to document exactly what happened regarding Al Raqqa. On March 3, 2013, the same day the rebels occupied the city, I was on the scene to retrieve some articles and books from the museum library. When I entered the museum, I was shocked to see armed men, including some local people from Al Raqqa city, occupying the museum, its hall and its offices, after they seized the guards' weapons. FL: What precautions had been taken by DGAM before the armed groups took control of the museum? DE: The Director of Al Raqqa museum had been requested by DGAM in Damascus to remove the most valuable and precious antiquity pieces--gold, tablets, and coins--and take them to the central bank of Al Raqqa. We did this, and we also installed iron gates for the storage areas upstairs, and hired more guards to secure them. Similar measures, I think, were taken in most other museums. FL: A multiple-part question, if you please--who are the militants who were at the museum and what were their attitudes? Did they appear intent on destroying "idols" and images, such as carvings and statues of human figures? Have you received eye-witness accounts from reliable local people who saw what was done, and if so could you give us a couple of examples? Were you able to speak directly with any of the rebels or their leaders, and finally is the museum currently occupied? DE: At the beginning of the occupation, some of them were fighting under the authority and banner of "the Syrian Free Army" and some of them were armed civilians from Al Raqqa city. I could recognize some faces of men who were known to previously have worked in smuggling antiquities (onto) the international market. But before long they seemed to be replaced with others. Today the Raqqa museum is occupied by (the) Islamic extremist group called ISIL. As for their attitudes toward destroying, I am not sure about this point, but I am sure that they are stealing and selling items, in spite of their claims about saving and protecting the museum. I have received reports about this from some of the rebels who told us that some of them had stolen many artifacts. Later, the manager of the museum and I reached one of the ISIL leaders, and we urged him to take care of the museum and its antiquities, and he promised to do so. FL: Does the process of looting the museum and the warehouse happen during the presence of militants? Did you see this activity yourself, and if so, when was it? DE: Yes they were at the museum, but I was not there at the precise time, and I did not witness them carrying out antiquities. They worked basically when no one was around, mainly at night, and we are told that they did so. FL: How did you know about the thefts from the warehouse or the museum, and how much of the museum's and the warehouse's contents had been smuggled out? Did you write a report at the time or at any time subsequently, and if so is the report available to us? DE: The director of the museum discovered this while checking the gates of the warehouse and its locks, and the member of the rebels, whom I referred to before, told us that in June of 2013 one of the armed groups, ISIL, opened the warehouse and stole eight boxes full of antiquities. Immediately we telephoned DGAM and told them about (the) looting, and they ordered us to make an inventory of the stolen pieces and send them a report. To date the report is not publicly available.